Last night – at half-time with the screen on pause, Belgium leading Brazil 1-0, Van Dyck would be pleased, I thought – we went to a view at Naked Eye for an exhibition of Susan Evans’s dreamlike sky and seascapes. It was a superb show. Evans’s landscapes have been compared with Turner and Constable for obvious reasons, precise observation of the effect of light and weather translated into symphonic grandeur. And with Rothko, for the vibrating bands of colour. Some of her paintings have a haunted, surreal air that reminded me of Arnold Boecklin. But the furnace sunsets, here in Red Reflections, are like the fiery heavens in John Martin, Turner’s contemporary who specialised in scenes of Biblical judgement. Curiously, when I looked John Martin up just now, because I’m more used to The Great Day of His Wrath 1851 at Tate Britain. I found this painting (c.1815? 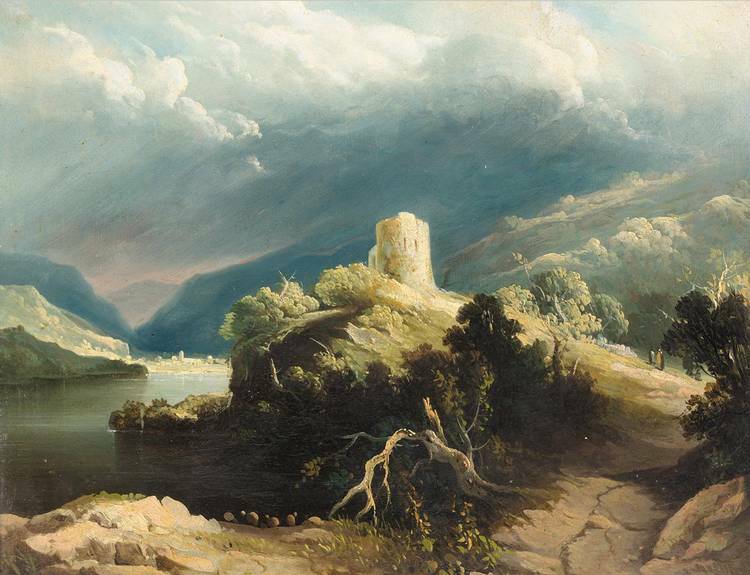 ), View of Dolbadarn Castle, North Wales sold at Sotheby’s in 2004. . I didn’t know Martin painted ‘straight’ landscape like this. It’s absolutely stunning. Here we had a brief moment of imagining owning it, the picture – oil on panel 9 x 11 inches, beautiful – and the castle. It’s monumental – the sky about to break on the land like a wave – and it’s a painting for the five senses. This is just what North Wales feels like, the vastness of the place and the weather. And the uniqueness. That soft green on the mountains behind. It’s the colour we saw in the wooded valleys Northwest towards Llangollen in early evening. The moment you enter a new landscape. Visionary and real. Evans’s Rain over Downs isn’t in the exhibition, but it’s worth illustrating because it shows the same feeling for landscape. This apocalyptic scene looks like the End Of Days, but it’s exactly what a storm looks like in our part of the world. We’ve looked from Devil’s Dyke, below and above two different weathers, looking down into the rainstorm through the same eerie yellow luminosity. Evans has exhibits and sells internationally, but she is a Brighton woman and she knows that these miraculous skycapes Keen to meet her, I spoke to one of a circle of women nearby. ‘I’m told that one of you ladies is the artist,’ I said..
Not the artist, my new companion said, but we’re her friends. And we had an excellent conversation about the painter’s technique – she builds up her paint in the middle of the canvas, with intense whites and yellow, a blink-inducing Turneresque boss for the sun, to give her paintings that intense luminosity, literally dazzling in the gallery light. ‘It’s so visionary, but real!’ I said, ‘We get weather like this here all the time.’ We agreed how well the exhibition was going – three large paintings sold at the view. Then we talked local things, and went on to admire some ceramic sculptures by Jack Durling. His Cloaked Cetacea, a set of whale heads, continue his series of portraits of endangered animals. Zak and I had liked Durland’s previous work, very moving figures of bears, rhinos and cormorants, in black with spatters of gold, exquisite until you realised it represented wounds and oil-soaked feathers. The whales are superb. We liked the humpback whale with its deep scars and barnacles. Texture, weight, motion, this is a sculpture you can hear. The flippers are superbly modelled, lithe and powerful – Durland said that he supported them in the kiln with sponges – and the whole thing is a piece of explosive movement. It sold during the view. A bit later, Zak asked me how talking with Susan Evans had gone. It was marvellous, I said. Lovely. I was talking to one of her friends tho. No, said Zak, I’m sure that was the artist, someone said. Of course, I thought. With a natural horror of flatterers and toadies, Evans had simply pretended to be someone. Like an episode of Frasier. Perfectly normal. How well that went. Frasier would’ve made himself look a complete buffoon. Then after a bit Zak came back, leading a woman whose photo he had just taken. In front of one of her paintings. And introduced the real Susan Evans to me. Something more was required. ‘It’s so visionary. But real!’ Then, ‘We get weather like this all the time…’ Mercifully Susan Evans had heard the previous conversation and asked about Jack Durling’s sculptures. ‘Susan, Jack,’ I said to them, ‘two artists who haven’t met yet,’ and withdrew politely. With huge thanks to David Donno, and Leah Sanger of Naked Eye Gallery, to the artists Susan Evans and Jack Durling, to the lady I enjoyed speaking with, and to Zak.